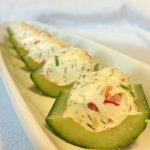 Keto cucumber bites are to die for with their yummy creamy filling! They’re a great low carb snack and are perfect if you’re following a ketogenic diet! When I saw the recipe for these I just knew had to make them! I love cream cheese and now that I am following a Ketogenic meal plan I use it quite often. It’s low in carbs and has fat in it, which make it a great addition to the plan. I have my cream cheese with veggies these days, instead of bagels! These cucumber bites are delicious and they are perfect if you are going somewhere and want to take a low carb snack. They actually turn out quite pretty on a tray. You can also stuff little cherry tomatoes with the same mixture! You can make them ahead of time and store them in the fridge. I hope you enjoy them, I make them frequently I love them that much! These cucumber bites are to die for! Theyâ€™re a great low carb snack and are great if youâ€™re following a ketogenic diet! In a mixing bowl, combine cream cheese, pepper, chives, dill weed and onions. Mix well and set aside. Cut the cucumbers lengthwise, remove the seeds and fill each cucumber half with your mixture. Then cut again in 1" chunks. Loved these. Next batch I added cooked & crumbled bacon to them, oh so yummy! What kind of cucumbers? Don’t they need to be peeled? If you use an English cucumber then you do not need to peel it. These are super good but do you have the macros for tracking purposes? Does anybody have a carb count on these? You can figure out the carbs all by yourself! Use a site like fatsecret.com to find the ingredients you use and then add up the carbs. If you are doing keto, subtract the fiber for the net carb count!